Your computer can now tell time in a compelling and beautiful way! View just one of the different faces, or set it to cycle through all three. 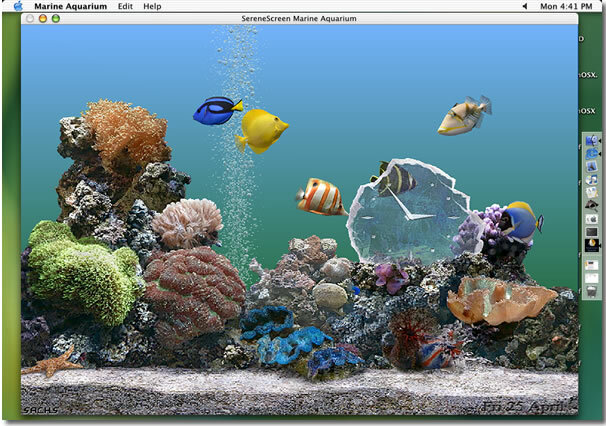 These screen shots give you an idea of what Marine Aquarium TIME looks like, although you really need to see it in action to get the full feel. The clock can be set to show the second hand or not, it can be set to indicate AM/PM or 24 hours; the timing of the cycling can be adjusted; and, among other features, you can set the calendar to start each week on any day of the week your heart desires! Marine Aquarium TIME has the same 21 great tropical ocean fish, with up to 7 fish on screen, plus the starfish. You can adjust the bubbles, the sound and the lights, or let the program adjust itself automatically. You'll love the effect when the fish pass behind the crystal and the etchings.